They are definitely “graphics” but they definitely are not novels. Non-fiction in the graphic format is a growing trend and can engage readers who might reject other non-fiction. 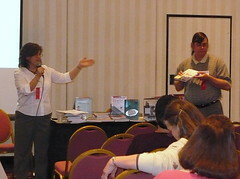 Two Rhode Island young adult librarians, Robin Lensing of Pawtucket Public Library and Ed Fuqua from Woonsocket Harris Public Library, discuss the advantages of adding non-fiction to your graphic collection. The program is sponsored by NERTCL. Lensing and Fuqua went through an extensive list of titles for non-fiction graphic novels that a library could add to its collection. I will post a link to the list here as soon as it is available on the NELA Web site. Fuqua noted that the popularity of graphic novels is really huge right now. Public reception of graphic novels is greater now than it ever has in history. Every major publisher has a graphic novel in print. While showing Beowulf by Gareth Hinds (Candlwick, 2007), Lensing said, “how hard is it to get kids interested in Beowulf?” If a kid needs to read Beowulf, the graphic novel may have more appeal than other versions. On the other hand, Fuqua said the graphic version of the 9/11 Report gives faces to the people who died in the attack. It can bring it alive for kids. It doesn’t matter if it’s fiction or non-fiction. The format is graphic novels, even if it is non-fiction. But this raised the question of where you should shelve your graphic non-fiction. “You should put things where you think your readers will find them,” Fuqua said. Some titles are put in fiction, others are put in non-fiction. It doesn’t matter to our patrons. It matters to librarians. A person in the audience said her library puts all its graphic novels together. It doesn’t separate fiction from non-fiction. Lensing, referring to a graphic novel about the Holocaust said, the benefit of putting it in non-fiction is that a child researching the Holocaust may come across the graphic novel. Fuqua added that several titles on the list don’t have popular appeal. They may work better with non-fiction books. Lensing also saw potential for working with these non-fiction graphic novels in school. What would be great, she said, if you’re working in a school is if you can get teachers to encourage students to write graphic novels. If they can see that graphic novels can be different than Spiderman, it may inspire them in a different direction.